Quarterback Case Keenum did not practice with the Denver Broncos on Wednesday because of what was described as "mild" soreness in his knees, according to local media reports. Keenum reportedly received treatment on his knees after he brought Denver from behind to a 20-19 victory over the Oakland Raiders on Sunday, driving the Broncos to a game-winning field goal in the final seconds. However, his sore knees are not expected to affect Keenum's availability for Sunday's game against the Baltimore Ravens. With Keenum sidelined, first-year quarterback Chad Kelly ran the first-team offense in practice. The Broncos also have quarterback Kevin Hogan on the active roster. The reports said Keenum is expected to practice on Thursday and Friday. 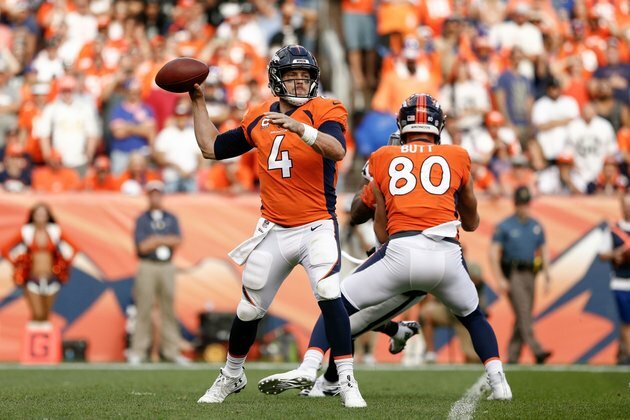 The 30-year-old Keenum, who signed with Denver as a free agent during the offseason, has completed 44 of 74 passes for 551 yards and three touchdowns with four interceptions while leading the Broncos to a 2-0 start to the regular season. He also rushed for a touchdown in the fourth quarter against the Raiders last week. The 6-1, 215-pound Keenum signed with the Houston Texans as an undrafted free agent out of Houston in 2012, and played for the Texans, St. Louis/Los Angeles Rams and the Minnesota Vikings (last season) before signing a two-year, $36-million free-agent contract with Denver.